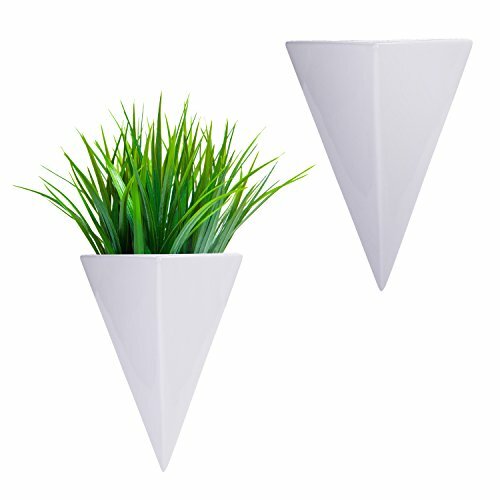 A natural accent for sleek modern environments, the simple triangular shape of these sconce-style planters make them look like built-in elements of the wall. The stark white ceramic material is the perfect complement to clean contemporary spaces, and provides ideal contrast for both colorful floral arrangements and vibrant green succulents. At 6 inches high and 5 inches wide, these mini planter vases have ample space to support lush plant growth, while their 3-inch depth allows unobtrusive placement at regular intervals to add dramatic dimension and invigorating plant color to any setting. SPECS: Each planter - 6.6 H × 5 W × 3.6 L (in inches). IDEAL SIZE: Perfect for succulents, herbs, cacti, flowers and more (plants not included). WALL MOUNTED: Both planters can be mounted or hung on any wall with proper mounted hardware (not included).